Before you use the technique you need to choose how you want the curve (straight line!) to map, or control, the image. In the Wedge example it was obvious that the Luminosity/tones of the image were important. And for the church, one wanted to be controlled by the blue aspects of the image. which doesn't show much contrast between the blue or orange areas. When you have made your choice, you run the appropriate Action and then start curving the straight line. The really nice feature of this correction is that, unlike any other colour space curving, a single point on the image maps down to the same position, along the line, for all the channels. You simply move the points up or down to either lighten or darken the image, or to add or subtract colour. You wind up with these Layers and make adjustments in the Curve layer. 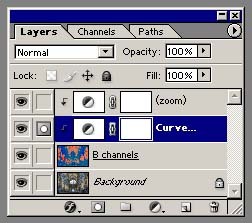 The top (zoom) layer controls the sensitivity of your Curve layer and does not normally need to be changed. The B channels layer is what is controlling your adjustment and is never touched. In point of fact you are doing all of this in Lab mode, and need to convert back to RGB when you are done. Before we get on to the actual Actions, here is another simple (overly) exaggerated example. 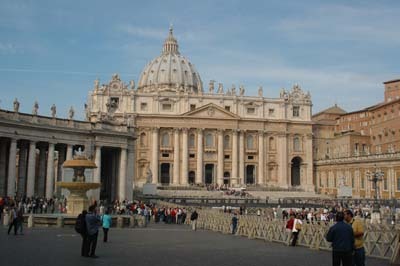 The out of camera image of St Peter's in Rome - I want to make it pop out of the image. First I need to view the Controlling channel options (there is an action to do this). I'll choose the 'a' middle one, so as not to upset the building on the right too much. These are the fairly simple curves, with lots of points to keep the changes to just the areas I want. 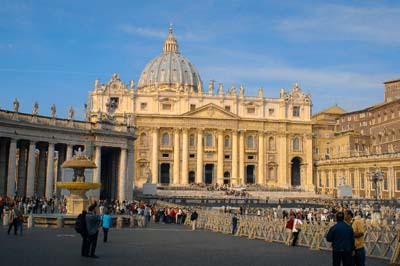 St Peter's is lighter (bump in the Lightness channel), has a touch of Magenta and more Yellow. St Peters now really pops and I've made the sky a bit deeper. Okay it is a daft example, but it demonstrates how easy this is to do. I think the important thing to notice, is how one can easily limit the adjustments to just the areas one wants to change.